It’s not officially summer in Vancouver yet, however the glorious sun decided to show upon this long weekend, creating a perfect recipe for an outdoor adventure. Typically, an adventure in Canada would mean hiking, snowboarding, skiing etc. 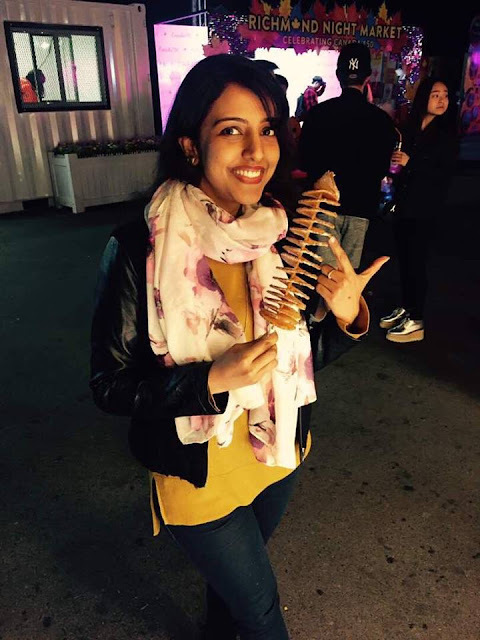 but lack of planning probably made me choose otherwise and I decided to explore the options within the city. I ended up doing a couple of interesting things. 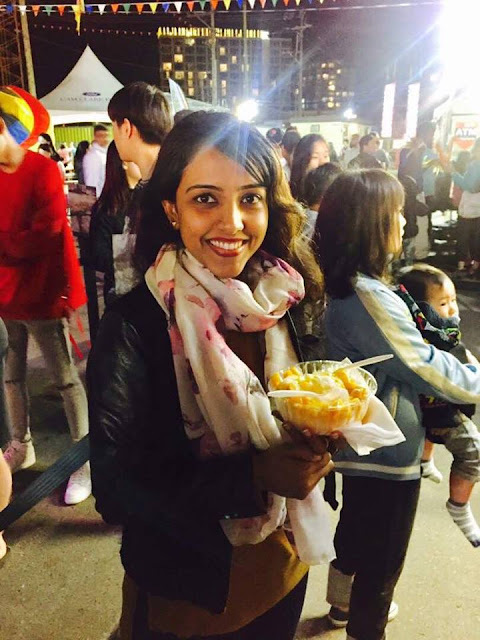 Besides watching the long awaited and much hyped movie “Bahubali” which turned out to be an excellent choice, I took my taste buds for a treat to the must-see “Richmond Night Market”. All credit goes to my friend from "Shiamak's" who recommended this place. Yes; there is “Shiamak’s” in Vancouver, story to be shared some other day perhaps. 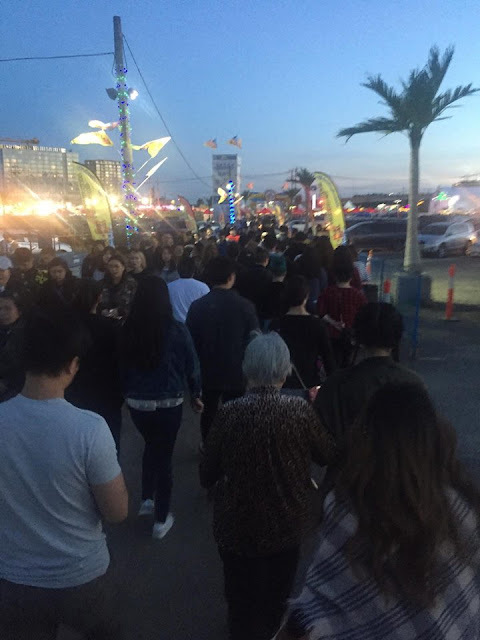 For the benefit of the readers who don’t know about this weekend night market it is one of the largest and longest running night markets in North America. 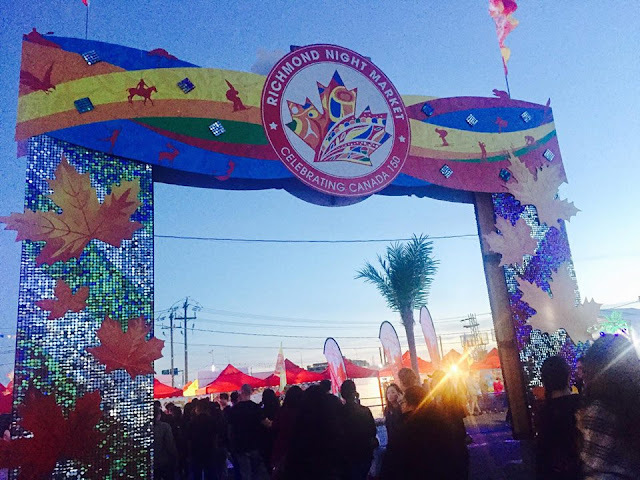 Started in the year 2000 the Richmond Night Market has become an attraction for visitors around the world, especially the locals and tourists who throng the market every summer for some good ethnic food, cool merchandise and entertainment. When I got there, I realised the hype was in fact right. I had to wait in the queue for 20 minutes to just get in. The entry fee of 3.75 was not a bad bargain (free admission for children and seniors). With the Zoom pass worth $25 one can not only skip the line but also use it for 7 visits. Check out the official website here for more info. 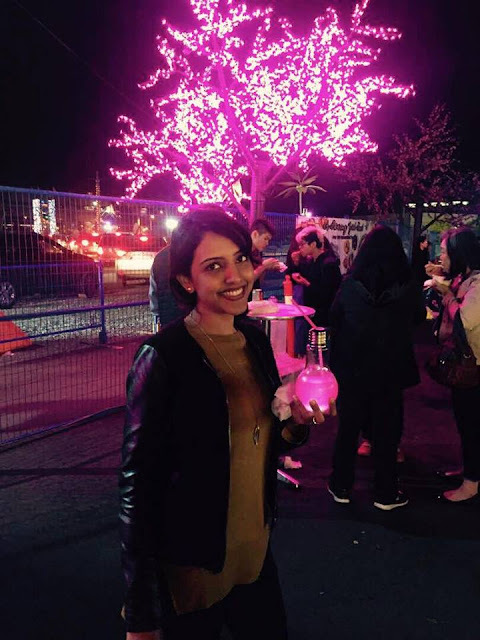 I must admit; the highlight of this market is its food and if I’m not wrong most people visit this place just to try the ethnic cuisine.Because of the large immigrant population in Richmond this night market has a strong South Asian influence. 200 food stalls with a little over 500 food choices made my life a whole lot difficult. Out of the 1000 things that I wanted to try I could only manage to have 5 food items, thanks to my below average appetite. Tip: Go in a big group so you can try multiple items. I picked my 5 items based on what attracted my eyes and taking a guess at crowd popularity. In the end, I was happy with all my picks and went home with a tummy full of explorations. 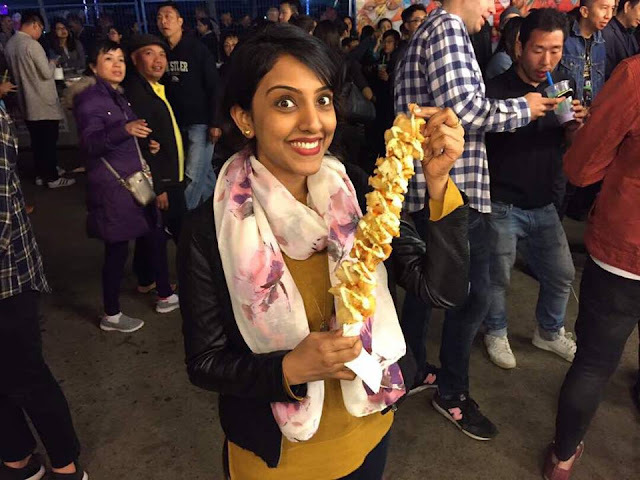 So I shall skip the suspense and quickly run through a pictorial description of what I actually ate at the Richmond night market. My favourite pick from the food section were the Fish sticks. Being a seafood lover this food stall quickly grabbed my attention with its attractive looking battered fried fish on a stick and a choice of sauce as topping.Well what could go wrong with a deep-fried fish with some tartar sauce on top! 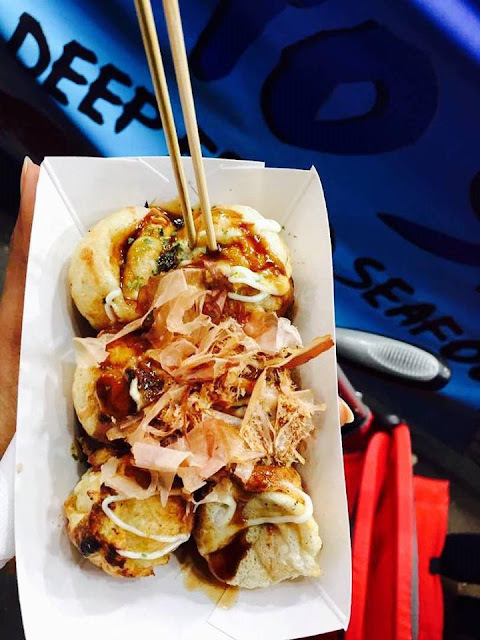 The next best pick was the Japanese Takoyaki; a ball-shaped snack made of a wheat-flour batter, typically filled with minced or diced octopus, however there were other fillings to choose from. I had it with the a shrimp filling. This one seemed to be a hot favourite of the night market given the never-ending queue outside its stall. 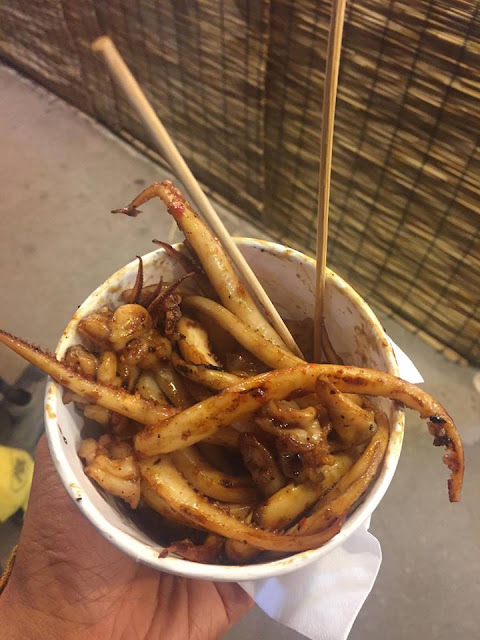 I had to try one although I’m not a fan of squid. The squids were pan fried with your choice of sauce. I went for the garlic lover and it was yummy! 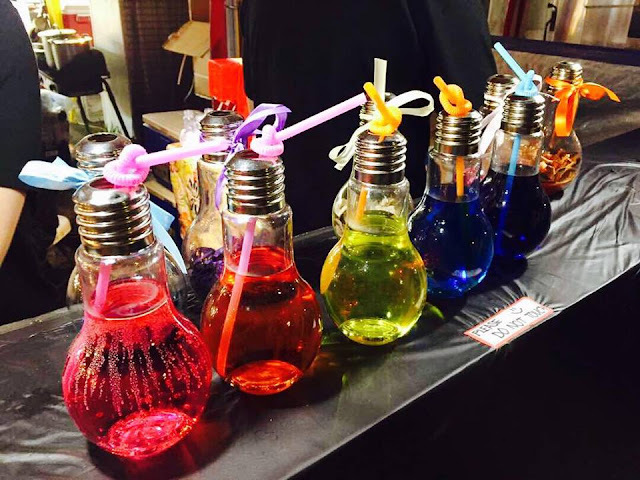 The highlight of the evening was, the fruit flavored beverage served in a bulb shaped glowing glass. The best part was that you could chose the color of your drink!It was quite an eye-catcher as a few people asked me the direction to its stall. This one never fails to disappoint. Mango lovers are all over the world and just like many others I jumped at the first sight of this food stall. 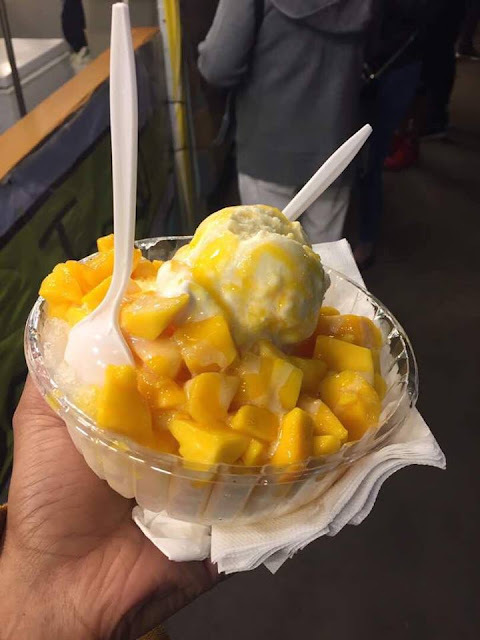 Diced mango with vanilla ice-cream and shaved ice-cream a perfect summery dessert. Need I say more??!! I was pretty much full at this point, and was about to call it a day when I saw the Rotato. It’s a spiral cut Russet potato on a stick sprinkled with your choice of seasoning. I picked sour cream onion after much deliberation over cheddar cheese and BBQ seasoning. 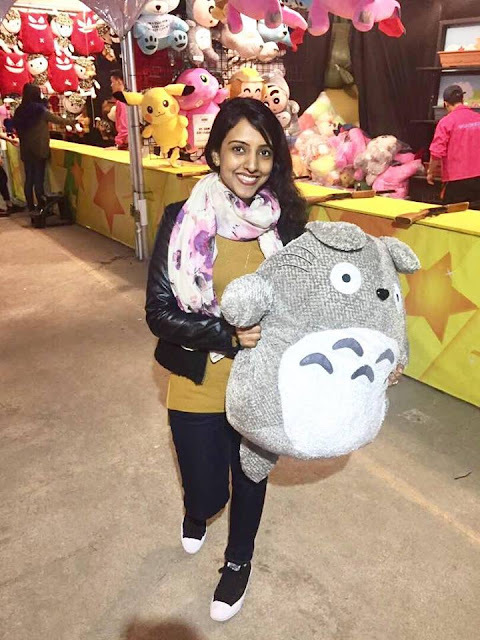 The adventure ended on a super happy note after I won the Totoro soft-toy at a game stall. This was without a doubt my favourite take-away from the Richmond Night Market. Canada has been so long on my list! Looks like so much fun!